SPIRITUALISM – THE NEW ADVAITA THEORY OF NON-DUALISM: THE LORD’S SONG-THE BHAGAVAD GITA, CHAPTER VII, PARAMAHAMSA VIJNANA YOGA(KNOWLEDGE OF THE ULTIMATE TRUTH), VERSE # 9: “I AM THE LIFE( THE “JEEVANAM”) OF ALL THAT LIVES.” It is the LORD GOD who lives and hence there is no separation of Body, Mind, Soul, Spirit, and God who is Living. I am sharing my view in response to a view shared by Srila Prabhupada, the founder of the International Society of Krishna Consciousness in his book, Science of Self-Realization. Firstly, I must state that Srila Prabhupada has not taken into consideration “The Totality of Things.” To describe “The Totality of Things”, the ‘Three Fundamental Distinctions’, or the Three Fundamental Dualisms must be recognized. The Three Fundamental Distinctions are, 1. the distinction between the natural and the supernatural, 2. the distinction between the material and the spiritual, and 3. the distinction between the living and the non-living(animate/inanimate). Substance, material, or matter is a fundamental requirement to establish man’s existence in the physical world. But, this existence becomes a reality if, and only if there is separation of living, and non-living matter or material. A living thing exists by separating itself from its external environment. This separation is supported by implantation of “KNOWLEDGE” in the substance of the matter that gets transformed into living matter. The evidence of the “KNOWLEDGE” that is implanted is detected in two fundamental characteristics of living things; 1. the ‘Consciousness’ or ‘Awareness’ of the fact/state/condition of its own energy-dependent existence by which the living thing knows that it needs energy-yielding molecules found in the matter present in its external environment, and 2. ‘Intelligence’ that involves the cognitive ability to acquire information, process information, store information, and use information to recognize the presence of other ‘Things’ present in the external environment and use them to gain energy and to make structures and perform functions to maintain its own living condition. Consciousness, and Intelligence are the two basic ‘spiritual’ functions of all living things. These are not physical, or chemical functions that are entirely determined by the Laws of Physical Sciences. These are not functions that are dependent upon man’s physical, or mental work. If soul or spirit is defined as the vital, animating principle common to all living things, its presence can be known if the matter is conscious and is intelligent. The separation of man into material body, thinking substance or matter called mind, and an immaterial part or principle called spirit or soul is not correct. The biological existence of man demands Unity. There is no Mind-Body dichotomy as the complete human organism is derived from a single fertilized Egg Cell. The human person will not come into existence if there is no functional, and structural unity between mind, body, and the various tissues, organs, and organ systems. The entity named spirit or soul does not belong to the transcendental, or metaphysical realm or domain. Spirit and Soul belong to the corporeal substance or matter. Man is not an embodied soul and in reality man is a living soul. The purpose of Self-Discovery is not that of God-Discovery. The concern is not about the existence of God, or the verification of God’s existence. Man has to discover his own true or real nature. For this, man has to understand as to what it is to be a substance and as to what it is to be in a condition, or state called existence. Spiritualism, the new ‘ADVAITA’ Theory of Non-Dualism seeks the Unity of man in body, mind, spirit, and soul. Such unity establishes the dependent condition called existence while man desires freedom in his thoughts, actions, and behavior. SPIRITUALISM – THE NEW ADVAITA THEORY OF NON-DUALISM: THE LORD’S SONG – THE BHAGAVAD GITA, CHAPTER X – VIBHUTI -VISTARA YOGA – THE INFINITE GLORIES OF THE ULTIMATE TRUTH, VERSE# 22, LORD KRISHNA STATES, “BHUTANAM ASMI CHETANA” – ” AND IN LIVING BEINGS, I AM CONSCIOUSNESS.” IF THE LORD IS THE SOURCE OF THE FUNCTION, THE FUNCTION IS A SPIRITUAL FUNCTION. Ann Arbor, MI 48104-4162, USA. The following is an article based upon the view shared by Srila Prabhupada in his book, The Science of Self-Realization. Who are you? Are you your body? Or your mind? Or are you something higher? Do you know who you are, or do you merely think you know? And does it really matter? Our materialistic society, with its unenlightened leadership, has made it virtually taboo to inquire into our real, higher self. Instead we use our valuable time maintaining, decorating, and pampering the body for its own sake. Might there be an alternative? 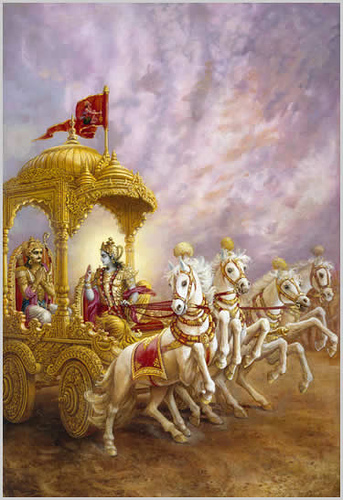 According to Vedic civilization, the perfection of life is to realize one’s relationship with Krishna, or God. 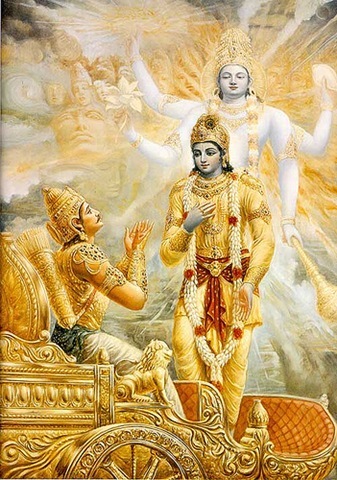 In the Bhagavad-Gita, which is accepted by all authorities in transcendental science as the basis of all Vedic knowledge, we understand that not only human beings but all living entities are parts and parcels of God. The parts are meant for serving the whole, just as the legs, hands, fingers, and ears are meant for serving the total body. We living entities, being parts and parcels of God, are duty-bound to serve Him.